Solomonia posts Rockets in the Garden, with video showing Hizballah rocket launchers that hide in a residential home after firing. You won’t see anything like that in last evening’s France2 newscast (in French; available until approx. 2PM EDT), showing the building where reportedly 60 people died from the Israeli bombing. Four minutes into the program, the reporters are taken into the house next door to the building by one of the former residents of the bombed building, who explains that he’s not with Hezbollah but has a beard because he hasn’t been able to shave for 2 weeks. The house next door is intact after the bombing. The owner (See Update 4 below) claims that he’s not with Hezbollah, but there are many photos of Nazrallah on display, including the daughter’s certificate from Hezbollah’s school. The homeowner very calmly claims that his family had taken shelter in the building that was bombed and they all died. The reporter, Loic de la Mornais, concluded the segment by saying that this area had become radicalized after the Israeli occupation. On Sunday, a total of 140 rockets – the highest number in a single day since the beginning of hostilities on July 12 – rained down on northern cities, including Nahariya, Kiryat Shmona, and Acre. Air Force Chief of Staff Brig.-Gen. Amir Eshel said Sunday night that the three-story building had been struck by the missiles a little after midnight and that it only collapsed seven hours later, at close to 7 a.m.
“It was clear that we could never accept a destabilization of Lebanon, which could lead to a destabilization of the region,” Douste-Blazy said in Beirut. And, of course he wants a diplomatic solution. Update 3, EU Referendum wants to know, Who is this man? Who is this ubiquitous fellow wearing the green helmet? , complete with Robert Fisk article. Stephen Pollard asks, Was Qana staged? L’Ombre de l’Olivier looks at Qana-llywood, and Roger’s wondering, Is Qana another Jenin? A nurse posting at France Echos (in French) notices that several of the dead children appear to have severe disabilities. At the bottom of the page, a commenter told the blogger that Euronews had said that “the building was occupied by handicapped children”, while the official version says that only the children of two families were involved. Anti-Syrian elements in Lebanon openly point finger at Hizbullah as guilty of killing of dozens of civilians in order to curtail plans for disarming group. ‘Hizbullah has placed rocket launcher on building’s roof and brought invalid children inside in bid to provoke Israeli response,’ they write. Hezbollah . . . put in place a Machiavelian plan by creating an event that would cancel the [deployment of the Lebanese army to South Lebananon, which would disarm the militia of the party of God]. Knowing very well that Israel will not have a state of heart to bombard civil targets, Hezbollan militants of Hezbollah installed rocket launchers on the roof of a building in Cana and brought in crippled children with the firm intention of creating a new situation, using the massacre of these innocents to take again the initiative of the negotiations. I have no words to express my revulsion. 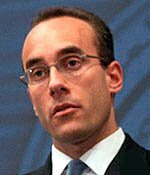 A research report issued by the Library of Congress Federal Research Division, Organized Crime and Terrorist Activity in Mexico, 1999-2002, quotes (p. 43) Mexican former national security advisor and ambassador the United Nations, Adolfo Aguilar Zinser, as saying that “Spanish and Islamic terrorist groups are using Mexico as a refuge.” The report also cites an El Norte Spanish-language news report that there are approximately 400,000 Arabic speakers in Mexico mostly located among the large Lebanese and Palestinian communities of the northern city of Monterrey, nearby the U.S.-Mexican border. America’s enemies have identified this vulnerability; according to a March 2005 Time Magazine report, al-Qaeda lieutenant Abu Musab al-Zarqawi instructed jihadists to bribe their way into Honduras and cross the U.S. southern border to attack soft American targets. From an intelligence perspective the indicators and warnings of the threat cannot be clearer. IS IT REALLY WAR THEY HATE? But Arabs will fight to the bitter end for their religion, their families and the land their clan possesses. In southern Lebanon, Hezbollah exploits all three motivations. The Hezbollah guerrilla waiting to ambush an Israeli patrol believes he’s fighting for his faith, his family and the earth beneath his feet. He’ll kill anyone and give his own life to win. Yousef Shehadeb, 46, a member of the Islamic Center of the Tri-Cities, recalled Haq as quiet and something of a loner. Shehadeb said he and Haq’s father, Mian Haq, both work at the Hanford nuclear reservation, as do many members of the area’s Muslim community. Via Juan, behold the Happy Map (PDF file). While on the happy subject, a study out of Princeton concludes once your income goes above an additional 12,000 dollars a year, it has little effect on your life’s happines. Maybe if you’re a tenured professor with a six-figure income, a subsidized mortgage, and help for the kids’ college tuition but I believe they’ll find a lot of volunteers willing to prove them wrong. This edition has all the unabridged text, and wonderful photos and maps that really bring to life the story. Please note that the print is very small, particularly for the illustrations, so you might want to remember when purchasing it. The difficult life of Sister Maria Celeste is beautifully told, and is based on the translation of 124 surviving letters to Galileo by his daughter. While many will argue about Diamond’s thesis, the book is a fascinating, enjoyable, read. Starting this week, you can find all my book reviews and picks at my new page, Fausta’s buys. British law enforcement . . .
. . . is sorely lacking, as Clive Davis has found out. ANZOATEGUI mobilizes against the Israeli agression on the people of Lebanon. 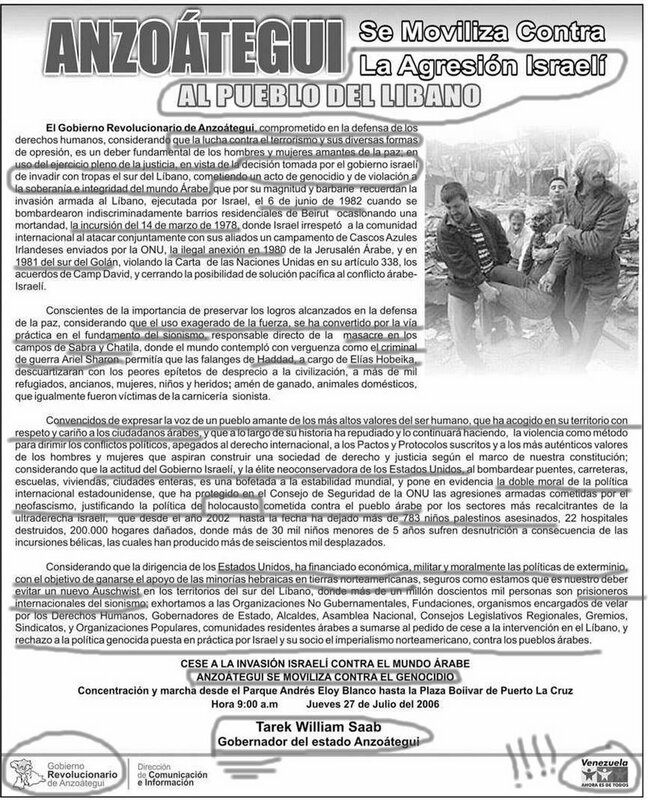 The Anzoategui Revolutionary Government, committed to the defense of human rights, committed to the view that the fight against terrorism and its many forms of oppression is a fundamental right of peace-loving men and women; in full use of justice, in view of the Israeli government’s decision for its troops to invade southern Lebanon thereby committing an act of genocide that violates the soverignty and integrity of the Arab world, [an act] whose magnitude and barbarism recall the invasion of Lebanon by Israel on June 6, 1982 when entire neighborhoods in Beirut were bombed indiscriminately causing death, the March 14, 1978 incursion when Isreal disrespected the international community by attacking with its allies a camp of Irish Blue Helmets sent by the UN, the illegal annexations in 1980 of Arab Jerusalem and in 1981 of the Golan Heights, violating UN Resolution 338, the Camp Daviod accords, and shutting down any peaceful solution to the Israeli-Arab conflict. Aware of the importance of preserving what has been attained in preserving peace, [aware that] Zionism’s fundamental practice is the extreme use of force, directly responsible for the massacres at Sabra and Chatilla, while the world watched in shame as war criminal Ariel Sharon allowed the Haddad phalanxes under the command of Elias Hobeika rend civilization apart with more than a thousand elderly, wounded, women and children refugees; plus livestock and domestic animals, that were also victims of the Zionist carnage. I could translate further but you get the gist. published in El Nacional (an opposition paper, read by the intellectual elite of Venezuela if anything because it carries the only literature section worth reading in Venezuela). Iranian firms have invested $1 billion in Venezuelan ventures to date, and the industry ministry says it hopes to expand this to $9 billion in the coming years. Since it’s Hugo’s 52d birthday, there’s probably the local equivalent of cake and ice cream on the menu. A reminder: Fausta’s blog has a new address. Please update your bookmark and your blogroll. In recent months, he has bought from Russia 40 Mi35 helicopters and 100,000 Kalashnikov rifles. He is negotiating for up to 24 Brazilian Super-Tucano ground-attack planes and four Spanish naval corvettes. Hugo was barely starting to warm up back then. By last January, Hugo had signed contracts valued at more than $1 billion with Iran – with a nuclear program in sight – and in February this year Hugo committed $500,000 million towards a Chinese space satellite. This week the shopping spree continues. Moscow has cultivated ties with China and sought to forge its own line in the Middle East, restoring Soviet-era relations to regimes at odds with the U.S. such as Syria. and Hugo’s trying to buy Venezuela a seat in the UN Security Council. 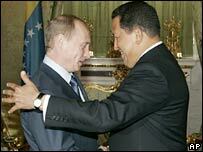 No wonder people are asking, Chavez, Ex-USSR: A New Axis? Publius Pundit has an excellent round-up of posts on Hugo’s travels, which has scheduled upcoming stops in Qatar, Iran, Vietnam and Mali. It’s quite plausible that North Korea would sell one or more nuclear weapons to Iran for a few billion dollars. considering that a straight flight between Iran and Venezuela is not economical for neither sides, it has been agreed that this flight stops in an agreed European country and then heads towards its destination. It’s not too much of a stretch to picture Belarus as the stopover, but would it be economical? Once the jets and the bombs are in the Caribbean, Hugo’s not even going to need Fidel to be able to get within firing range of major US cities. Worse prospects await his neighbors. Of course, I’m indulging in a most fanciful conspiracy theory, as Christian Oliver of Reuters would say. Maybe Christian Oliver can join in the chuckle. Just in case, let’ hope Hugo runs out of oil and money before the IOUs come due. While the Sadriyyun lack the sophistication, weaponry and social welfare services of Hezbollah, both are funded by Tehran; and both organizations represent the same ethnic, religious and socioeconomic demographic within their respective countries. Mr. Sadr’s organization is, in fact, about where Hezbollah was 20 years ago. Jimmy Carter, wearing a bra, that is. This friend came up with a suitable Freudian observation: “Subconsciously, artist may have wanted to portay JC as HC”. Update 2 The Anchoress says that Hillary looks like the love child of Jimmy Carter and Eleanor Roosevelt, but I think it’s more like Jimmy and James Carville. Update, Friday, July 28 What has Steve Buscemi done to her? 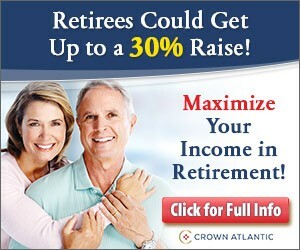 And don’t miss the video. The guy who did the Britney Spears giving birth statue came up with this beaut, too. CNN Blogger Has Trouble Defining Terrorist: Tom Foreman, CNN Correspondent can’t seem to be able to define the term. Here’s where to start, Tom. More items later. I’m back. First, an item you might miss: U.N. Employee Is Charged With Drug Smuggling, as part of a ring that brought 25 tons of contraband into New York in the past year and a half. A Canadian U.N. observer, one of four killed at a UNIFIL position near the southern Lebanese town of Khiyam on Tuesday, sent an e-mail to his former commander, a Canadian retired major-general, Lewis MacKenzie, in which he wrote that Hezbollah fighters were “all over” the U.N. position, Mr. MacKenzie said. Hezbollah troops, not the United Nations, were Israel’s target, the deceased observer wrote. After Kofi libelously accused the Israeli Defense Force of a “deliberate targeting” of four blue-helmeted U.N. observers, France2 (in French, available until 2-3PM EDT) reported that Kofi had apologized (2:30 minutes into the program), when in fact he didn’t. Kofi said he accepted PM Olmert’s words, and would order an investigation. Claudia Rosett says, Who’s Dissin’ Whom: There’s a disproportionate response all right. Update, via Atlas, take a look at the area of Beirut that is actually being targeted. Update, via Jane, and the propaganda’s effect is felt by many. What the video does not show is the result of the terrorist raid. The terrorists you see in the film murdered six Israeli soldiers that night, aided and abetted by paid employees of the United Nations Relief and Works Agency for Palestine Refugees (UNRWA). One thing for sure, Kofi won’t be hiring Wretchard, who has a thorough analysis, and a hypothesis. John Batchelor looks at Iran, the War Elephant in the room, through the lens of the Spanish Civil War, and silence and denial in EUrope. As Richard points out, the EUropeans are not even in the game, while at the same time, they’re trying to get further out. Neo-Neocon asks, What hath the UN wrought?, while Sigmund, Carl and Alfred, Dr. Sanity, and Shrinkwrapped analyze the situation. Update Al Qaeda’s buzzards test their wings. They dream of flying “from Spain to Iraq”.